Want to work on your child’s printing and fine motor skills for hand-writing? 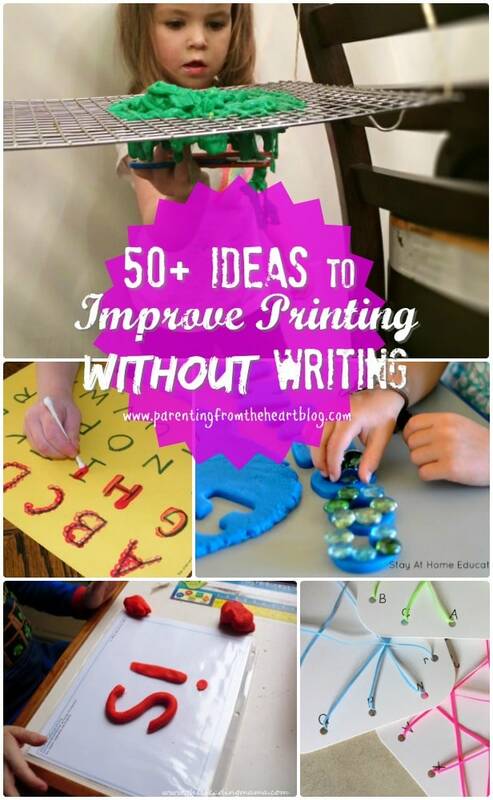 Below you will find play-based learning ideas to improve printing without writing. I remember those printing books from elementary school with each letter written solidly, then in an almost connect-the-dots form, and then with room for us to try copy the character on its own. It was a monotonous task filing out each letter over and over and over again. While I do see the value in them, doing one or making my child do one at home is seems about as exciting as watching a Kanye West fashion show or being stuck listening to the teacher from Farris Bueller’s day off. No thanks! 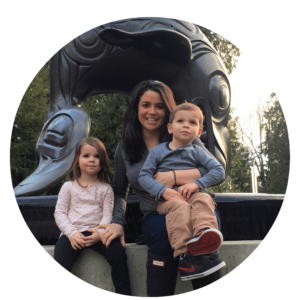 Recently, I asked my daughter’s preschool teacher if there were any skills we could be working on at home. While there absolutely is a time and place for printing worksheets, I won’t be using them in our household anytime soon. My daughter is just shy of four and the best way for a child of her age to learn is through play. Furthermore, she is a strong-willed little person. And sitting down to partake in a decontextualized, monotonous task would not be on her short list of things she’d like to do. So we’ve been working on letter recognition, pincer grip, fine motor skills, and hand-eye coordination while having fun. Below are __ Ideas to Improve Your Child’s Printing Without Writing including my own ideas and the ideas of many other INCREDIBLE mommy bloggers organized into groups. Create a “Letter Hunt,” hiding letter fridge magnets as you would Easter eggs. Have your child collect and name them with your help. Try fishing for letters (includes free printable and instructions). Make a letter recognition game using alphabet magnets or stickers. Using a cut tennis balls and foam letters, create a letter munchy ball game. Have your child trace letters using paint and a q-tip! Create matching lacing cards for children to tie uppercase to lowercase letters. 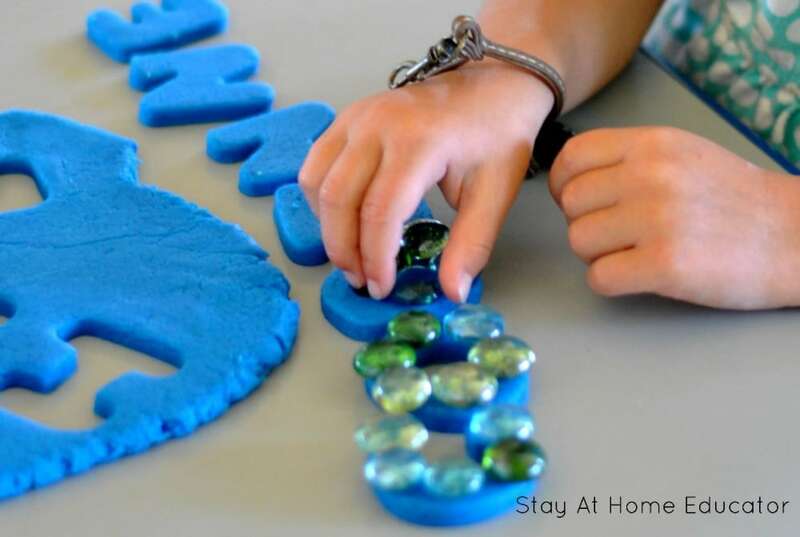 Using letter cookie cutters, play dough, and flat marbles have your child practice “writing” their name. Trace names and letters with bingo stampers. Write your child’s name on a sheet of paper and encourage them to trace it with a bingo stamper. Thread spaghetti with cereal! Put spaghetti into play dough and have your child put cereal on spaghetti. Make fine motor flowers using pipe cleaners, scissors, and tissue paper. Play a gathering game using small rocks or toys. Make a no-sew button snake and have your child button squares of felt onto it. Muffin tin sorting: Use a muffin tin and a bunch of little items (paper clips, pom poms, shopkins, lego pieces) and have your child sort them. Make candy birds’ nests – only requires three ingredients! Have your child trace letters using paint and a q-tip. Thread pipe cleaners with beads (don’t forget to knot the bottom). Print off these painting templates for q-tip painting. Teach your kids to sew with yarn and burlap sack. Have your child put toothpicks into an empty spice jar. Check out these toy ideas for perfecting pincer grip! Make fine motor flowers using pipe cleaners, scissors, and tissue paper or using construction paper, markers, and scissors as seen here. Make candy birds’ nests – only requires three ingredients!. Make goo and have your child cut it as it drips down a cooling rack or colander. See 25 fine motor activities here. Give your kids chopsticks and set up a sensory bin for them to sort through them. Work on hand-eye coordination and fine motor with these 12 ideas. Give your kids spray bottle and have your kids water the plants. Build with Duplo or Mega Bloks. Play with Mr. Potato Head. Have your child use a clothes pin or tweezers to pick up pom-poms and paint with them. A turkey baster and a sensory sink is a great way for your child to work on hand strength too. Find over 30 more hand strengthing activities here. There are so many ways to support building fine motor skills that are fun and it is so important for our kids. 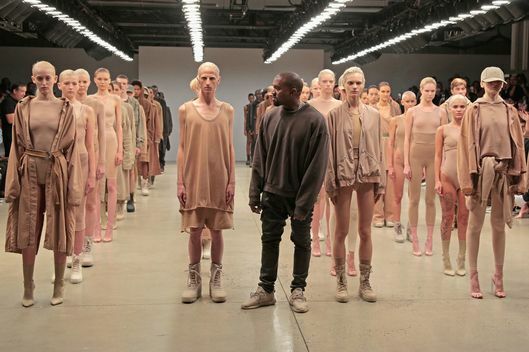 You have such a wonderful collection here. Thank you! Alana, this list is incredible!! My kiddos and I can keep busy for days! Thank you so much for putting it all in one place! It took A LOT longer to put together than I’d thought but I’m excited to go through it too. My kids will love this stuff! That’s what I was thinking! I can’t imagine how much work it took you to put it all together. Wow! But so many fantastic ideas!! There are so many awesome ideas here for my daughter! I pinned this for later! This is awesome! So many great ideas! My twins will be four in May and are really getting interested in letters. We’ve actually been practicing recognition with Cheese-Its and Animal Letter Crackers….and then they eat them 🙂 Pinning this so we can try out a lot of them before they head to preschool in the Fall. I freaking love everything about this post. 1) It encourages play-based learning which the research says is absolutely the very best way that kids can learn (especially at an early age) 2) no worksheets 3) It makes learning fun! 4) so many ideas!!! Pinning and stumbling! Omg so many awesome ideas!!!! I will definitely be giving a few of these a try with my daughter! THIS is a great resource! Especially for the hand strength! My little guy has had a little trouble with that, so we’ll definitely be doing some of those activities listed above! A must-pin list! Thanks so much for including my qtip letter painting activity. It is a favorite in my house. Thank you for this amazing roundup of ways to improve printing skills without writing! Our little one is great with scissors but not so great with holding pencils and crayons, so these should be a fun way to build that skill. Interestingly, my three-year-old is great with holding a pen and with scissors, but my four-year-old struggles with pencil grasp. She is not the type of kid that direct instruction works well with and as a result was the inspiration behind this post to improve printing without writing. I hope your little one enjoys as much as we did!